The unavoidable problem with austerity, Blyth insists, is that it cannot work as a general policy (this is an example of the fallacy of composition). Austerity can work for a country so long as other countries take a different tack: these other countries must spend and expand. But if all countries deflate, the global economy shrinks, perhaps irreversibly. We can't all cut our way to growth. 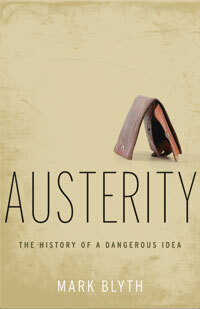 Blyth provides an account for austerity as an idea. He identifies its various English, Scottish and Austrian sources. But it is the triumph of German 'ordo-liberalism' that gives austerity its currency. Germany, after all, is an economic and political success and is a quite ordered place. And in today's Europe, Germany calls the shots. But Germany's peculiar success simply cannot be replicated by Spain or Ireland or Greece today; no amount of austerity will convert those economies into export powerhouses. Austerity grew out of Blyth's brilliant five-minute YouTube video. And much of the bite of Austerity can be found there. But the book deftly shows how this idea, though quite a bad one, captured the imagination of policymakers.